Caption slip reads: "Photographer: Rustan. 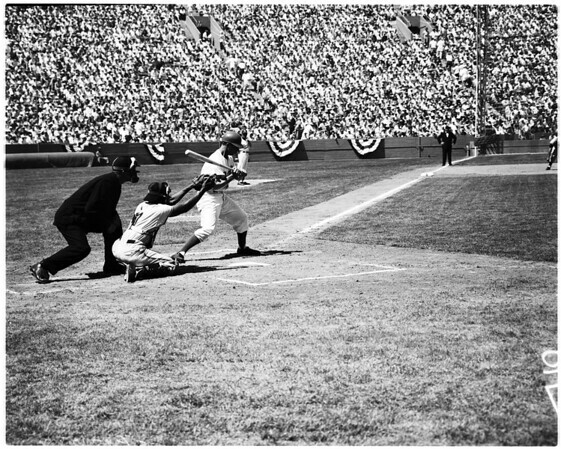 Date: 1958-04-20 Assignment: Baseball, LA -- SF. Special instructionS: Action -- 8 minutes. 5: 19 SF, first homer. 6: 7 SF catcher attempt bunt by Drysdale -- out. 9: 9 LA foul ball, first inning. 49: Pee Wee Reese pops up foul far out, first inning. 10-50: Pee Wee Reese batting, first inning. 25: 19 SF, homer (may be second one). 26: 14 LA falls ducking wild pitch by SF 41. 51: Franks, SF & Walter Alston & third base umpire in argument over close pitches. 29: 12 SF looks it over but doesn't swing on third called strike, first out. 91-92: 12 SF at bat. First 2 balls pitched. 30: Willie Mays out at home. 52: 6 LA homer brings in 11 LA, fourth inning. 41: 41 SF pitcher covering first to put out 6 LA, fourth inning. 42: 8 LA catcher pops up foul by 30 LA. 43: 8 LA catcher hit by foul ball(? ), 20 SF batting, sixth inning. 44: 19 SF batting, hit 2 homers earlier, sixth inning. 93: 41 SF bunts. 46 LA throws to second for out on 19 SF, sixth inning. 45: Franks talking to pitcher (41 SF), 14 LA on second base. 43 LA (not shown) was on first, sixth inning. 46: 20 SF scores from second base on single by 7 SF, seventh inning. 94: 11 LA third base catches pop up far out as 41 reaches home. Third out, no score. 7: 7 SF safe at home on hit by 12 SF, eighth inning. 8: SF's winning pitcher gets handshakes after game"